Compare prices on car hire in Glasgow from all the major brands and find the best deals. When you book through us, unlimited mileage and insurance are always included in the price given. 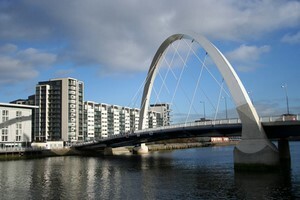 Glasgow is situated in the south of Scotland , near the River Clyde.It is about 30 km to the river’s outlet in the North Atlantic west of Britain. Glasgow was first mentioned in sources in the 1100s and was in the 1960s, Europe’s fourth largest city. Thereafter the population and today is the number of just over 580 000 (2006). This does, however Glasgow to Scotland’s largest and the UK’s third largest city. In Glasgow there are several historic buildings, but most stem from the 1800s when the city expanded during industrialization. One of the city’s older buildings is the University of Glasgow from 1451 Construction of St. Mungo’s Cathedral began in the 1200s and is today a well-known attraction. Glasgow also boasts many parks, the oldest of which dates back to the 1400s. World’s First Religion Museum is located here, along with a host of exhibitions and museums. Visitors can take the plane to Glasgow International Airport which is located approx. 11 km west of the city.The airport was the second busiest in Scotland in 2008.